Tapping on a record from the table list or search results will bring you into the record details screen, where you can view more details about the record. When the record is editable, an “Edit” button will be available in the upper-right corner of the screen. 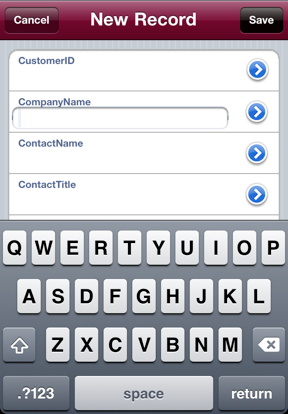 Tapping the edit button will allow you to tap on a field and change its contents, and then tapping “Save” will save the results back to the database. ☞ Note: in order to be able to edit records, the table must have a “primary key” defined which is used to uniquely identify the record. If you are unable to edit a record, the reason is probably because the record does not have any primary key defined. Tapping on the plus button in the toolbar of the record list will create a new blank record whose fields you can fill in and save. ☞ Note: in order to be able to save new records, the table must have a “primary key” defined which is used to uniquely identify the record. If you are unable to save a new record, the reason is probably because the record does not have any primary key defined. 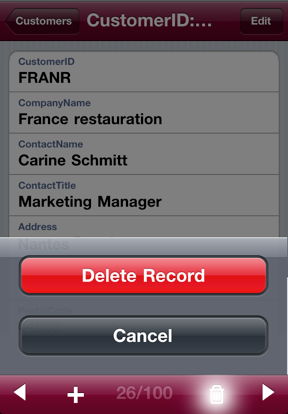 In the record details screen, tapping the trash icon will allow you to delete the record from the database. ⚠ Note: Deleting a record from the database is permanent and cannot be undone. ☞ Note: in order to be able to delete records, the table must have a “primary key” defined which is used to uniquely identify the record. If you are unable to delete a record, the reason is probably because the record does not have any primary key defined or due to a lack of permissions in the database.